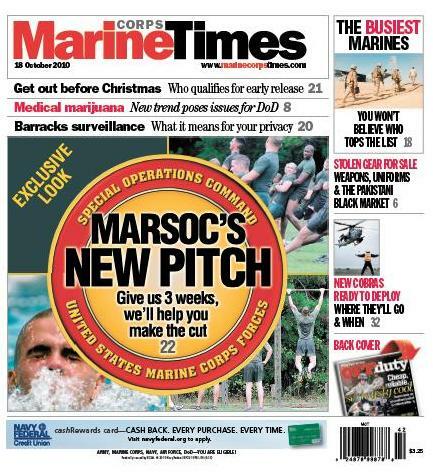 The Oct. 18 issue of Marine Corps Times is on newsstands now. In this week’s print edition, on newsstands now, staff writer Gina Cavallaro takes readers inside the Corps’ new special operations warm-up course at Camp Lejeune, N.C.
Called the Assessment and Selection Preparation and Orientation Course, or ASPOC for short, it represents Marine Corps Forces Special Operations Command’s latest effort to curtail a 46 percent attrition rate among Marines looking to become elite critical skills operators. The commandant has challenged MARSOC leadership to cut that rate to 20 percent — a tall order indeed, and one the command is taking very seriously. This three-week course, conducted at Lejeune’s Stone Bay training facility, eases candidates into the spec ops mindset and incrementally works them up for the rigorous physical demands that accompany MARSOC’s initial screening, and subsequent assessment and selection process. Additionally, participants get ample face time with active-duty operators, who provide detailed glimpses into the spec ops lifestyle. Parrington and others within the command hope, too, that the course will help erase longstanding apprehension among quality Marines who may feel that making the cut is simply too tough. It is tough, they say, but it’s not impossible. With more focused preparation, MARSOC has identified a means to give CSO candidates the leg up they may need to become the best of the best. Cavallaro teamed with staff photographer Sheila Vemmer for this assignment, putting boots on the ground at Stone Bay and hanging out — in the rain — with Marines slogging their way through the first ASPOC, which wrapped in early October, and the instructors on hand to coach them. It’s a detailed, gritty look at the new first step to joining MARSOC. This is a huge load of BS… why help the weak learn how to be strong they just get into a team and regress back into the sorry state they were before. the standards in Recon school have dropped incredibly since I went to ARS in early 05. if you failed a two ruck runs you got dropped , now they hold your hand and tell you it’s ok…. it’s not ok…. the recon indoc should be a walk in the park the school should be hard and when you reach a team then it’s time to feel the pain. If a Marine wasn’t born for recon than why help him skate thru he’s just going to put our lives in danger when he hits a team. if you were weak before your gonna be weak again. this is a joke your taking a respected special forces group and turning into a bunch of slacker that just want the black shorts and jump wing real recon Marines just want to deploy and work.